Why do we celebrate the annual Memorial? (Which this year falls on Monday, April 14.) Because Jesus told us to "keep doing this in remembrance of me." And the apostle Paul further explains that "for as often as [we] eat this loaf and drink this cup, [we] keep proclaiming the death of the Lord, until he arrives." (Luke 22:19,20; 1 Cor. 11:23-26, NWT) Last week the Watchtower Study presented as fact that Jesus arrived in 1914, and how he has been ruling in God's kingdom for the past hundred years. That raises the valid question, if Jesus has already arrived, then why are we still proclaiming his death by observing his memorial? According to the Society's custom of celebrating the Memorial, it is not so much about proclaiming the death of the Lord until he arrives, as it is proclaiming his "anointed bride class" until they depart. It has become their celebration, an evening when they get to identify themselves and demonstrate before all onlookers that they are the only ones who are in the new covenant with God, while also exclusively claiming Jesus as their mediator. How they love the attention! (Compare Matt. 23:2-7, 13-15) That is why a considerable amount of time is spend on explaining to the observers who accepted their invitation as guests, why they, as the anointed "little flock" members, are the only ones entitled to partake of the bread and the wine. Why wouldn't they want to invite as many as they can fit into the Kingdom Hall or whatever other place they may rent for that occasion? It doesn't matter to them that many of the invited ones may not even be believers. (John 15:14; Matt. 7:23,24) All this is far from the manner in which the Lord's evening meal was observed in the first century, as Paul indicates in his letter to the congregation in Corinth. (1 Cor. 11:20-22) Those brothers did not engage in a campaign of inviting strangers as observers to an elder giving a talk on why the invited ones should not partake of the Lord's evening meal. The many "inspired expressions of error" that are taught in God's name are really the teachings of ambitious, yes, presumptuous men. (1 Sam. 15:17, 22,23) That is why the apostle John tells us to "test the inspired expressions to see whether they originate with God." (1 John 4:1, 6; 1 Tim. 4:1,2) We do this by comparing everything that is presented as coming from God with God's own Word, which alone contains his "inspired expressions of truth." (John 17:17) Have you tried sharing Jesus' words regarding his presence from the Bible with fellow worshippers in your congregation? What has been their response? Do most love the truth and gratefully accept what the Scriptures say; or do they accuse you of apostasy? When I quoted to an elder (a close relative) Jesus' words regarding what the sign of his presence really means―that he is not yet here, but near (according to our own Bible)―he simply answered, "What difference does it make!" Isn't that the sort of reply one would get from an unbeliever? 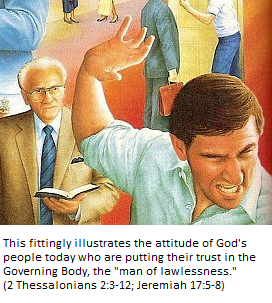 The above picture, as it appears in one of the Society's publications, aptly illustrates the attitude of God's people today, for they have become mere followers of the foretold "man of lawlessness." This "lawless one" has seated himself within God's temple, basing his assumed position of authority on the false claim that Jesus appointed him (as a group) in 1919. (2 Thess. 2:3-12) Many of God's servants have come to "love the lie," reasoning that Jehovah wants his people to accept the ever changing "inspired expressions of error," even when these clearly contradict God's Word of truth. (See Footnote) "Stare in amazement, O you heavens, at this; and bristle up in very great horror,’ is the utterance of Jehovah, ‘because there are two bad things that my people have done: They have left even me, the source of living water, in order to hew out for themselves cisterns, broken cisterns, that cannot contain the water.’" ―Jeremiah 2:12,13; NWT. In June of 2011, a riot broke out in Vancouver, British Columbia, Canada, when a crowd of about 100,000 hockey fans crowded into the downtown core of the city in anticipation of their team winning the coveted Stanley Cup. The mood of the crowd quickly turned ugly when their team lost. Fist fights broke out; 17 cars were set on fire (including police cars); businesses were vandalized, having their store front windows smashed; while many onlookers took advantage of the situation by streaming into the stores, ransacking and looting them, and emerging with stolen items which they proudly displayed to the crowd as though they were trophies. Over 1,000,000 photos and almost 1,600 hours of video were taken during the riot, which later enabled the police to identify and lay hundreds of charges against many of the rioters. What is of special interest is the fact that many of the rioters and looters were otherwise law-abiding citizens, with no previous criminal records. In court, their defence lawyers argued that they had simply been "caught up in the moment." But it is what a person does at such "moment" that defines what sort of person he is. After all, not everyone was "caught up in the moment." The majority of the 100,000 did not participate in the riot, nor the looting. Many walked away, while a few even tried to prevent the rioters from causing all that damage, only to be themselves turned upon. The apostle Paul wrote: "For you yourselves know quite well that Jehovah’s day is coming exactly as a thief in the night. Whenever it is that they are saying: 'Peace and security!' then sudden destruction is to be instantly upon them just as the pang of distress upon a pregnant woman; and they will by no means escape." (1 Thess. 5:1-5; NWT) Rather than calling it Jehovah's day, as does the New World Translation, other Translations say "the day of the Lord" (ESV), or "the day of the Lord’s return" (NLT). Is the coming sudden destruction "Jehovah's day," or "the of the Lord's return," referring to Christ Jesus? Does it matter? Consider for example the influence conspiracy theorists have on many people today. Their alternative explanations on world events, and who it is they are holding responsible, seems to be filling a void as they are appealing to a growing number of people, mostly those who are disillusioned with the governmental authorities, and who have lost faith in their religion. This has also enticed many of God's people to "be turned aside to false stories." (2 Tim. 4:2-5) Some former zealous Witnesses [relatives of mine included] have no problem acknowledging that the Watchtower magazines contain "inspired expressions of error," but will become defensive when their version of what is making the evening news is challenged. (1 John 4:1, 6; 1 Tim. 4:1,2) Their concern seems to be that while Jesus' presence may still be years away, there are things happening right now that pose a real threat to our immediate existence. They become impatient when we mention God's kingdom as the sole solution. In the world we are having tribulation! (John 16:33) The congregation meetings should be a place of refuge, where we find peace and love; and where we can be an encouragement to fellow worshipers of Jehovah. (Isa. 25:4; James 2:14-17; 1 John 3:10,11) The apostle Paul explains that this is the purpose for our meetings, when he says: "Let us hold tightly without wavering to the hope we affirm, for God can be trusted to keep his promise. Let us think of ways to motivate one another to acts of love and good works. And let us not neglect our meeting together, as some people do, but encourage one another, especially now that the day of his return is drawing near." Yes, we need each other's encouragement to help us keep a firm grip on our integrity and faith in God's promises. This is so vital, because as Paul goes on to say, "if we deliberately continue sinning after we have received knowledge of the truth, there is no longer any sacrifice that will cover these sins. There is only the terrible expectation of God’s judgment and the raging fire that will consume his enemies." (Heb. 10:23-27; NLT) The encouragement we receive from fellow believers helps us to keep our focus on God's promises. Since none of the numerous ancient Greek manuscripts available today contain God's name, Jehovah, many have argued that we should not call "upon the name of Jehovah." (Rom. 10:13) After all, they reason, if God wants us to use his name in our worship, would he not have preserved it in the Greek Scriptures? And since Jesus called God his "Father," and taught us to pray to "our Father in the heavens," they also strongly suggest that it may even be disrespectful to address God by his personal name, Jehovah. Do they have a legitimate argument? Paul's warning to the elders in Miletus soon proved true, when he told them that "from among you yourselves men will rise and speak twisted things to draw away the disciples after themselves." (Acts 20:29,39) That warning is just as valid today as it was two thousand years ago, for Satan is still bent on destroying our relationship with Jehovah. In our day we have been tremendously impacted by the "times and seasons" as calculated by Charles Taze Russell; in fulfillment of the Scriptures regarding the apostasy, and "the man of lawlessness" within God's temple, whose presence is "according to the operation of Satan". Like in the case of "the sect of Nicolaus" in the first century, Satan has succeeded in subverting the congregations today by means of the teachings of those who were greatly influenced by "the sect of Russell." The Watchtower Society (which was founded by Russell), has acknowledged that, "For some 35 years, Pastor Russell thought that the Great Pyramid of Gizeh was God’s stone witness, corroborating Biblical time periods. But Jehovah’s Witnesses have abandoned the idea that an Egyptian pyramid has anything to do with true worship." That was nothing less than divination, as one Watchtower acknowledged, stating "that Jehovah needed no stone monument built by pagan pharaohs and containing demonic signs of astrology to confirm the witness given in the Bible." (jv chap. 14 p. 201; w00 1/1 pp. 9-10) And although the Society claims to have abandoned Russell's idea of how he arrived at his Biblical time periods, yet they have not abandoned his results; having built an entire form of worship on his date of 1914. God does not directly send an “operation of error” to these deceived ones. He lets it go to them, in order to prove what it is that they want and also because this is really what they want. This is what the apostle Paul pointed out to his fellow missionary Timothy in a final letter to him. Paul explained why he wanted Timothy to preach God’s Word urgently in all seasons in the Christian congregation. Paul said: “For there will be a period of time when they will not put up with the healthful teaching, but, in accord with their own desires, they will accumulate teachers for themselves to have their ears tickled; and they will turn their ears away from the truth, whereas they will be turned aside to false stories.” (2 Timothy 4:2-4) By means of the inspired Word of God a person can protect himself against an “operation of error” during the presence of the “lawless one.” But by letting Satan carry on an “operation of error” and by thus letting this operation go to the professed Christians, Jehovah God puts them to the proof as to whether they “accept the love of the truth” or love the lie.